I auditioned for Universal Studios! My first visit to Universal Studios was when I was just a few years old. 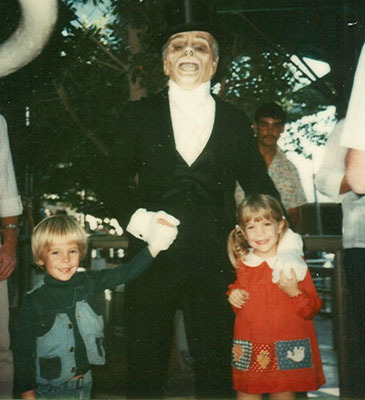 My favorite photo from that day is of my brother and me happily posing with one of the atmosphere characters, a scary-looking monster. One of my favorite childhood memories of Universal Studios is being selected from the audience at the (now long gone) Wild Wild Wild West Stunt Show, being dressed up in costume, and being in the show. I still have the videotape that documents my performance. Over the years, whenever I visit Universal Studios, I've continued to raise my hand when the show hosts ask for volunteers to be part of the show. I've ridden in a DeLorean while pretending to go back in time, been attacked by a giant cat, and created sound effects at Universal Studios Hollywood, and I survived an earthquake in a shopping mall at Universal Studios Orlando. I only wish that they would ask for volunteers to be in the WaterWorld show. I was always curious about the actors who work at the parks. When I saw a notice for an open audition for park atmosphere performers and Special Effects Stage hosts for Universal Studios Hollywood, I just had to check it out. Other than being over eighteen years old, the only requirement was to prepare a one minute comedic monologue. I found an essay that I'd used as an audition piece back in college, cut it down to a minute, ran through it until I'd memorized it, and headed to Universal Studios Hollywood. The audition was held at Universal CityWalk. I parked in the CityWalk parking structure, found the designated location, and stepped up to the table just outside the door. "Are you AGVA?" a pleasant woman asked. "Do you now or have you ever worked for Universal Studios?" "No." I don't and I haven't. She handed me a color coded card and a smaller sheet of paper, gave me a numbered sticker to place on my left upper chest, and sent me to a second table. A man took my picture. A woman asked me to remove my shoes and step on a scale. I was weighed. I was asked to step up to a tape measure. My height was recorded. Then I was directed into a big room with tables. I took a seat and filled out my forms. The colored card asked for my contact information and posed questions like, "Are you willing and able to cover any visible tattoos and piercings?" and "Are you willing to wear heavy makeup and a wig?" It also asked which roles I was interested in. The smaller paper listed the dates of the rehearsals and performances and asked whether there were any dates that I could not work. I took my completed forms to the final tables where they were collected and stapled together with the photo that had been taken of me and my headshot and resume. I was told that, if cast, I'd be required to join AGVA (American Guild of Variety Artists). The two actors in front of me, who currently work at Universal Studios, turned in forms that their bosses had signed giving them permission to audition that day. Then I waited. I met Eric* who was attending his third audition for Universal Studios after having auditioned for their Halloween Horror Nights and Grinchmas. He had played a costumed character at Walt Disney World in the past and now works as a courier while he pursues an acting career in Los Angeles. I also met Tricia*, a former Universal Studios Hollywood tour guide, who was a walking encyclopedia for all things Universal Studios and show business in general. The only question that she couldn't answer was when the Wizarding World of Harry Potter was going to open at Universal Studios Hollywood, but even current Universal Studios employee, Mark*, couldn't answer that one. Mark works as a masked, non-speaking character and really enjoys his job at the park. He told me that the speaking roles that we were auditioning for that day have a higher pay rate than the masked characters, but I don't think that money was Mark's sole motivation for auditioning. He seemed ready for the challenge of a speaking role. He had a wonderful, authentic accent that fit one of the roles that was being cast perfectly. Finally, about an hour after I arrived, I was led, with nineteen other auditionees, into a large room. There were chairs where we were asked to sit, in numeric order. The chairs were separated from the rest of the room by room dividers. We were told to go, one by one, to the other side of the room dividers where we would perform our monologue for the auditioneers. We were reminded to "keep it clean" (we were told not to say anything that we wouldn't say in a theme park full of children), that we would be cut off at one minute, and to be sure to show off any accents that we had (they were specifically looking for British, French, New York, and Donkey (as in Shrek)). Although it was difficult to make out all of the auditionees words from the other side of the barricade, it was fascinating to listen to the monologues. Two or three actors introduced themselves; most went straight into their monologues. About one-third of the actors used accents, one man even did some "Arnold Schwarzenegger." Two women in our group of twenty did the same exact monologue and another woman did a variation on it. [Note to future auditionees for Universal Studios, Disney, or any other theme park: if you choose the Neverland 911 monologue from the play, CSI: Neverland, you will probably not be the only one.] Some people performed monologues that I assume they'd written themselves because they were specifically geared toward one of the roles being cast. When it was my turn, I walked past the barricade. There were four auditioneers, three women and one man. They were all making notes when I entered. After a few seconds, they looked up and I began. They all gave me their undivided attention during my entire monologue. They seemed delighted by my performance, but everyone I met that day was extremely respectful and tried to make the experience as nice as possible. When I was through, they thanked me and I went back to sit with the other auditionees. When we had each done our monologue, we were all sent back to the first room to wait to find out if we would be asked to return for a callback. After about five minutes, a woman came out carrying some small cards. Out of our group of twenty, five people were invited for callbacks the next day. Mark got a callback for the role he'd wanted. He showed me the little card listing a callback time and his role checked off of a list. A woman, who'd done a New York accent during her monologue, was also selected. Eric, Tricia, and I were left empty handed. The woman invited everyone to come back and audition again in the future. I went home with some, but not all, of my curiosity satisfied. It would have been fun to attend the callbacks and maybe even work at the park, but it's probably more fun to visit the park as a guest. The next time I visit Universal Studios Hollywood, I hope Mark will be out from behind his mask, using his improv skills to entertain the park goers. And, when the show hosts at the Special Effects Stage (maybe one of the people I saw at the audition) ask for audience volunteers to be a part of the show, I'll be raising my hand. I did this in 2012 in Universal City, California, USA. * Out of respect for the actors' privacy, names were changed and identifying information was avoided in this review. Find Jen's list of bucket-list-worthy things to do in the Los Angeles area here.